Many of us want a robust renewable energy portfolio. Electricity production from large-scale photovoltaic (PV) installations has increased exponentially in recent decades, illustrating an increase in the acceptance and cost-effectiveness of this technology. Along with this upsurge in installations, though, we have seen an increase in the assessment of the impacts of utility-scale PV. We are investigating the ecosystem-scale impacts of transitioning natural drylands to large-scale PV installations. Our ecosystems supply us with nearly countless "services", including scrubbing carbon from the atmosphere through photosynthesis, regulating the local climate, providing food and habitat for wildlife. How do we balance our needs for these ecosystem goods and services with those supplied from large-scale PV installations? What ecosystems services or disservices do we derive from PV power plants? Because they are a renewable energy source, a transition to a PV power plant will mean that we are producing electricity with minimal water use and carbon release to our atmosphere, but are there unintended side effects? One potential side effect: Does a transition to a PV power plant create a heat island, similar to how a transition from a natural to an urban ecosystem creates an urban heat island? As with the Urban Heat Island (UHI) effect, large PV power plants induce a landscape change that reduces albedo so that the modified landscape is darker and, therefore, less reflective. This is really a question about "energy balance" - how sun energy is reflected, moves through an ecosystem, and is stored or re-radiated back to the atmosphere. Check out this Illustration of midday energy exchange. Assuming equal rates of incoming energy from the sun, a transition from (A) a vegetated ecosystem to (B) a photovoltaic (PV) power plant installation where all plants are removed will significantly alter the energy flux dynamics of the area. Within natural ecosystems, vegetation reduces heat capture and storage in soils (orange arrows), and infiltrated water and vegetation release heat-dissipating latent energy fluxes in the transition of water-to-water vapor to the atmosphere through evapotranspiration (blue arrows). These latent heat fluxes are dramatically reduced in typical PV installations, leading to greater sensible heat fluxes (red arrows). Energy re-radiation from PV panels (brown arrow) and energy transferred to electricity (purple arrow) are also shown. Through a large-scale experiment where we monitored monitored temperatures over a natural desert, a large PV installation, and an "urban" parking lot for more than a year to see if we found a PV Heat Island effect. We found temperatures over a PV plant were regularly 3–4 °C warmer than wildlands at night, which is in direct contrast to other studies based on models that suggested that PV systems should decrease ambient temperatures. ... So does this mean that solar PV power plants are a bad thing? Absolutely not! 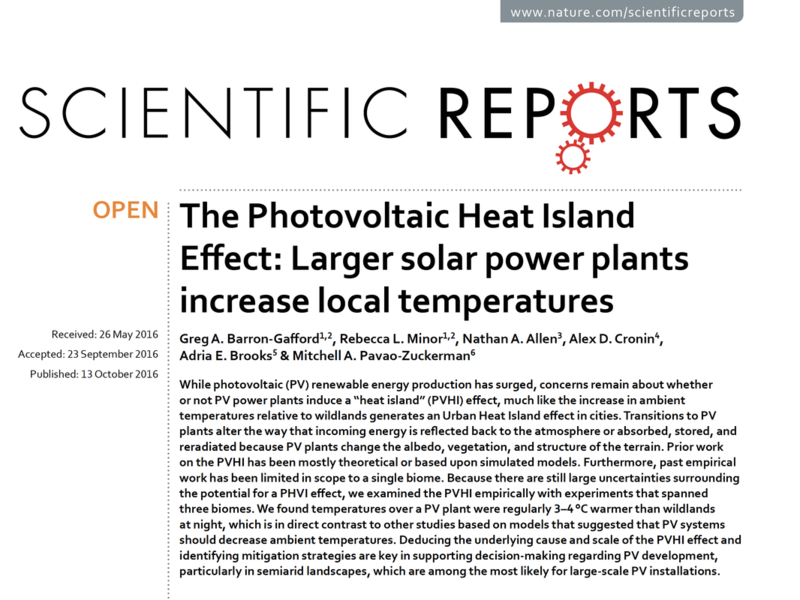 This research simply illustrates an advance in our understanding of how PV power plants create a warmer local environment. Is the heat island large enough to reach surrounding homes? More experimental research is required, but our preliminary work suggests that the Photovoltaic Heat Island Effect is constrained to a small area around the PV installation itself. To fully contextualize these findings in terms of global warming, one needs to consider the relative significance of the (globally averaged) decrease in albedo due to PV power plants and their associated warming from the PVHI against the carbon dioxide emission reductions associated with PV power plants. An integrated approach to the physical and social dimensions of the PVHI is key in supporting decision-making regarding PV development. Solutions to cool temperatures & boost other ecosystem services? ... So what can we do to mitigate the PV Heat Island Effect? We are investigating the potential for reintroducing vegetation into the typical PV power plant installation in drylands, which essentially reintroduces latent energy fluxes. Basically, if you think about these two ways to get rid of sun energy from an ecosystem (sensible and latent heat loss), we are trying to increase the latent heat loss from plants so that there is less sensible heat loss (the heat we feel). Such a simple concept that can potentially have a big impact? ... But will this work? This is our hypothesis - an informed idea - but we need to test this out. 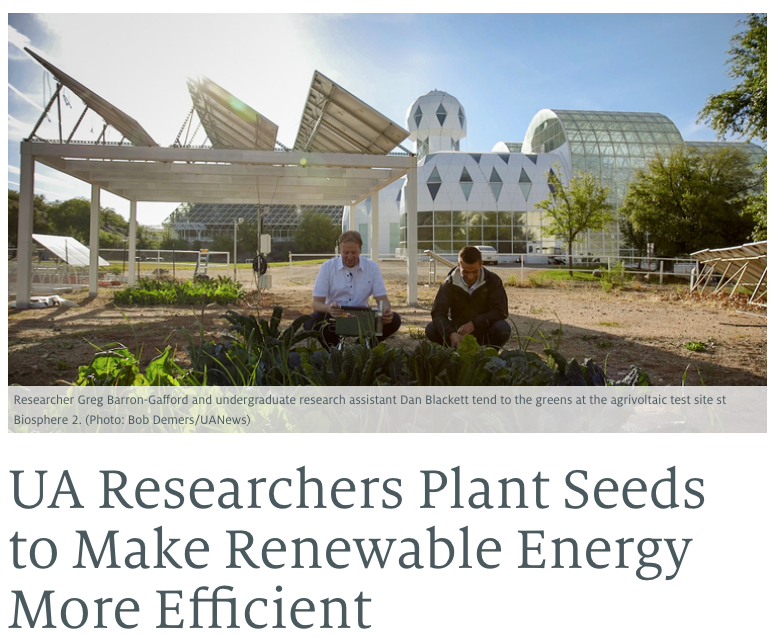 We have begun pilot studies at Biosphere 2 working with food crops (see story below) and within other local PV installations using native grasses. Check back to learn more as the results come in! In the mean time, here is a great video courtesy of UANews.